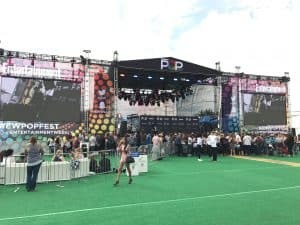 GoDolphin attended EW Popfest, and kindly reported on his experiences. I had a 2 day VIP ticket, which gave me a lot of advantages, including allowing me to attend the Doctor Strange screening on the first night of EW Popfest. Another advantage was that doors opened at 11.30am for VIPs, but at noon for general admission. 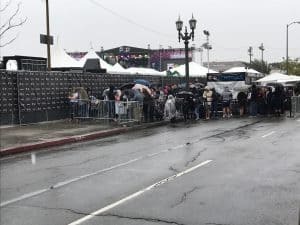 There were maybe 200 or so VIPs in line when the doors opened on Day 1 of Popfest, and maybe 300 in the general admission line waiting to get in. The first thing I did was to see if there was any swag at any of the outside booths. I saw a Lego Dimensions Fantastic Beasts booth and a VR booth but there was no swag at either of them. Starz had an Ash vs Evil Dead photo op booth with some of the same swag from NYCC but with zero wait. There was swag to be had at the Lip Sync Battle booth, but only if you performed on stage. The Kind bar booth had free Kind bars all day long and a tote bag. M&M candy and Pop chips were available free all weekend, basically as much as you wanted. There were makeover booths where you could get your nails done or makeup etc. 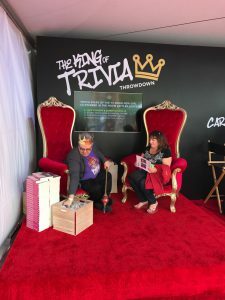 A King of Trivia booth where you had to answer 4 trivia questions in a row correctly was fun, each one would win better swag as you went. The best part of the outdoor exhibits was the Survivor challenges area. You could compete against a friend or wait until the afternoon when former Survivor contestants arrived, and challenge them. You won a Survivor buff from this season if you won a challenge. I spent quite a bit of time here throughout the weekend, competing and talking with all the former contestants and with Jeff Probst. They were all great, as were the team running the challenges who are the same team that runs them and creates them for the show. Everyone at this booth was taking photos and signing things for the fans. Also outside was the outdoor main stage, which had VIP areas with some seating and VIP bars. General admission was in the middle, standing room only. Inside The Reef venue on the ground floor was an area for any planned signings, mainly book authors. FYE had two shops selling books and also other items related to some of the talent appearing throughout the weekend. Upstairs was The Theater which I think held around 400 people, The Studio which held about 200 people and The Podcast lounge which I didn’t go into but it was very small: I heard under 100 people. And therein lies one of the problems of the event: the Main Stage had plenty of space for everyone that purchased a ticket, but the other areas reached capacity very quickly for the popular panels. There was a big mess on Saturday. The fire marshals wouldn’t let anyone into the building. I luckily wasn’t interested in going in at that point, but there were lots of angry people in a long line outside. On my first day after scoping out the swag and layout, I went to catch the first 15 minutes of the panel for digital Youtube stars in the Theater. Then I went back to see the Supernatural panel, followed by the CW Superheroes. I left early to go back to the Theater to see the Oscar Contenders Panel. After that, it was back to the main stage for the Survivor panel, followed by a couple of hours of competing and hanging with the former contestants. I also squeezed in two book signings: Ransom Riggs and Anne Rice. Then it all went down hill….. There were these free drink coupons courtesy of the TNT show Good Behavior. They were handing these out all day to come back between 4-5pm at any bar to claim. I had about 5 of these coupons and used them all in about one hour. Then I remembered there was a Fox happy hour upstairs in The Studio with the cast of two shows: The Mick and Making History. So I went there and I was very merry. I talked to Kaitlin Olson, star of the Mick, and also chatted with EW editor-in-chief Henry Goldblatt and other people. So by now I was pretty plastered and I headed outside to the main stage to see Janelle Monae perform, as well as a bit of Nick Jonas’ show. What was a nice surprise was that many of these artists did meet and greets after their shows as well as signed and took photos for free. I stumbled back to my hotel after one Nick Jonas song, feeling the alcohol. So on Day 2 I was a bit hungover, but I was ready to tackle the final day at Popfest. One thing I made very clear to myself was that there was to be no alcohol today. I failed, as I will explain later. hotel. It wasn’t raining when I left, but it sure was when I got in line. 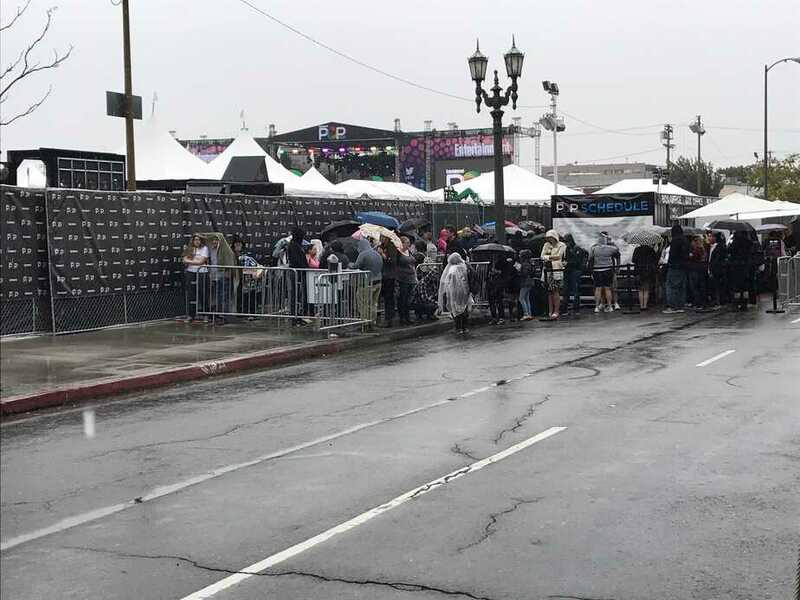 So people were standing in line without umbrellas getting pretty wet, although I was standing under the medical tent shelter waiting it out. Magically, at 11.45am the rain eased up and I strolled in. It did rain again for about an hour, but just drizzled. The big panel this day was the 12.30pm Fantastic Beasts Panel with sneak peaks of unseen footage and a conversation with Eddie Redmayne and Katherine Waterston. This was a really good panel with tons of sneak peek footage shown. 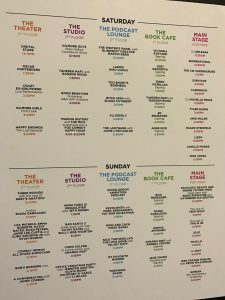 I also saw a panel inside at the Theater with Ryan Murphy and some of the stars from his various shows: Lea Michele, Emma Roberts, Kathy Bates, Evan Peters, Jaime Lee Curtis, and Cuba Gooding Jr. Again, this was another fun panel and with my VIP access I sat in the second row to the right. Okay, so the same girls who were handing out those happy hour cards the previous day were doing so again this day. I told them no, I can’t do it, but my hand was reaching out for the cards at the same time. I took it easy though and only had three drinks during the happy hour. If NCDS had been there, we might have been in trouble. I checked out JoJo and Tove Lo performing outside on the Main Stage, again with a meet and greet afterwards. OMG I met JOJO! I have to admit I’m not really up to date with today’s music so I didn’t know who these singers were, but I took one for the blog. Tove Lo performing on the Main stage. I went to an Amanda Peet signing, then went to the Studio to see the Office Christmas Party Panel with Jennifer Aniston, Courtney B, Vance, TJ Miller, and Olivia Munn. Sneak peaks and swag abounded and TJ Miller was hilarious as usual. I also was hanging around the Survivor area again all day, competing and meeting contestants once more, some different from the previous day. Dalton Ross from EW was also there all weekend and it was nice chatting with him as well. The Popfest finished with a Wes Craven tribute and the 20th anniversary screening of Scream. I had to head to the airport so unfortunately I missed the screening. So to sum things up, I would go to EW Popfest again, but I would have liked some free signings with some of the panel guests, or maybe a few more booths. If this event hadn’t had the Survivor challenges and meet and greet with contestants etc., I probably would not have been happy. But if you are mainly into panels and don’t care about free signings or swag then this is the event for you. I would recommend that you go VIP to skip the long lines. Here is a photo gallery from the event. 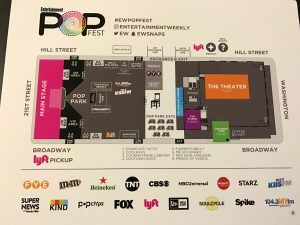 Are you interested in EW Popfest? Join the conversation on FoCC!